Side 1 printed with 1 PMS color using heavy coverage and 2 foil stamped areas on 18pt C1S White Semi-Gloss stock coated with Aqueous Matte. 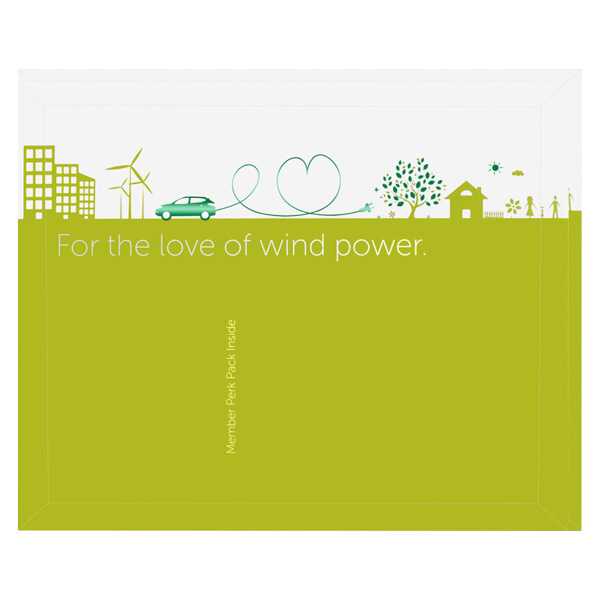 Alternative forms of energy are the stars of this envelope design. A Metallic Green foil stamped car heads toward wind turbines as its cord trails behind in the shape of a heart. The various shades of green add to the environmentally friendly design. A similar design is on the back with a larger car on the bottom. The foil stamp makes the car stand out on both sides and adds a dash of luxury. Great things come in small packages, like this 9 5/8" x 7 3/8" shipping product. The pocket's Conformer® technology lays flat whether carrying a single sheet of paper or a 3/4" packet. Sized to fit 9" x 6" post cards, brochures, or small presentation folders, the pocket seals with an adhesive strip that won't open until the recipient pulls the nylon tear strip. The landscape-oriented outer panels are the perfect place to include a compact design, including photos, descriptive writing, or branded elements. Dimension Closed: 9 5/8" x 7 3/8"
Dimension Open: 9 5/8" x 9 7/8"
Acceptable Insert Sizes: 9" x 6"